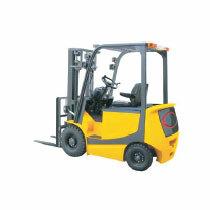 We manufacture and supply 4 Wheel Electric Forklift Truck. The 4 Wheel Electric Forklift Truck has precise design that ensures ease while working. The 4 Wheel Electric Forklift Truck is suitable to be utilized in construction area, warehouse, packaging department and several other places and so on. Cab design by SIP point, conform to EN-ISO 5353, ensures compartment with great comfortable and fatigue-free operating. With regenerative brake in reversing mode and regular brake pedal. Truck can stop after foot leaves the brake pedal. Reduce operator efforts and improve the brake life. Insulated battery cover, gas-filled cylinders.